Group Visits at The Hippodrome Circus01493 780223work Group VisitsThe Hippodrome, Great Yarmouth, is pleased to welcome visiting groups and provides a range of group friendly rates/incentives to enhance your visit. The historic Hippodrome Circus, Great Yarmouth, East Anglia’s mini Albert Hall. 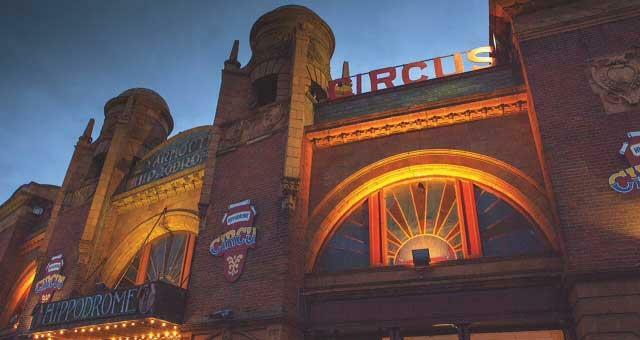 Visitors can enjoy the unique atmosphere of the Big Top in a fabulous 1903 landmark theatre; Britain's last surviving total circus building, one of only three still surviving in the world today. There are shows at Easter, Summer, Halloween and Christmas for all the family, with fun, thrills, excitement, and hilarious side splitting laughs with firm favourites Jack Jay and Johnny Mac. Free entry for organiser or coach driver. The Hippodrome, Great Yarmouth, is pleased to welcome visiting groups and provides a range of group friendly rates/incentives to enhance your visit. Times of shows vary please contact for details. For groups of 20+ a discount of £2 off adult seats and £1.50 off concession and child seats is available. Prices vary by show and seating area. Please check directly for further details. Thu 18 - Fri 19 Apr Pirates Live! Sat 20 - Mon 22 Apr Pirates Live! Wed 24 Apr Pirates Live!